There is no substitute to walking in the vineyards, talking to locals, breathing in the atmosphere and most importantly, trying the local dishes – that is how wine gets into your skin and you start to hear, not just the melody but also feel the rhythm. The world of wine has become wider, stretched to every corner of the globe, from the southern tip of the African continent to the northernmost regions in North America. Places that are extreme in temperature produce unique wines – like the snow-covered valleys in the Mosel where ice wine is harvested at −7 °C (19 °F), to warmer inland regions of South Africa or Central California where temperatures can spike up to 40 °C (104 °F). All are worth visiting, if only we had the time. While weather data, good travel books, Google satellite images and winery reviews can offer glimpses and snapshots into a region, traveling to the vineyards offers a different experience and dimension. 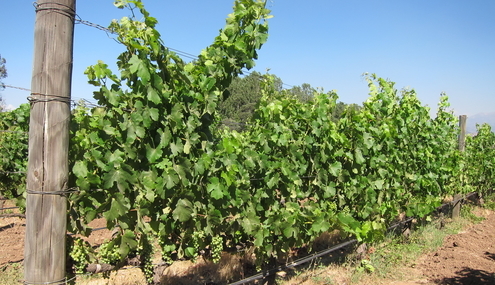 It is easier to understand a wine’s background and personality when tasting it with the vineyard stretched out before you and experiencing the unique grape growing environment. You appreciate anew the sweet tropical fruits of Californian Chardonnay while feeling the warmth of the Californian sun on your back; or experience the extreme change in temperature as the sun sets over the breathtaking mountains in Central Otago; or feel the grey slate under your feet standing in the steepest vineyards on earth in the Mosel. It is altogether a different experience enjoying a wine after hearing the winemaker speak so passionately about them. There are hundreds of unique and special wine regions worth visiting – for their beautiful scenery, unique wines and distinctive culture. Nearly every country in Europe, for example, produces wine and more and more regions around the world are expanding into winegrowing including China. Below I narrow the choices to five destination for those who are just starting out in oenotourism, a growing industry where holidays revolve around visits to wine regions. The top five must-visit regions I select below are classics – the places I keep going back to, for their scenic beauty, the wonderful food, terrific wines but most of all, the amazing people who bring their wines to life. The first time I woke up and saw the snow-covered town of Cochem in Mosel, it took my breath away. It was like a scene from a fairy tale where at any moment an angel might descend from the sky or a Prince on a white horse would ride through the town. I had to rub my eyes a few times to take in the scene and convince myself I was awake and not sleeping. Although this region is most crowded during the summer months when there are more tourists than locals, I would highly recommend a winter visit when the sleepy towns are free of tourists. Then, you find the real flavours from restaurants frequented by locals and the pace of life much slower while the vines sleep through the winter months. Among Germany’s thirteen wine regions, Mosel is by far the most famous and among the most beautiful. This region is named after the Mosel River, a long and winding river that rises in the Vosges mountains in France and makes its way to Germany and joins the Rhine River. As a wine region, it traces its roots back to the early Roman empire and wineries that are several hundred years old is not uncommon. The region was known as Mosel-Saar-Ruwer as a tribute to its three rivers, but was shortened to Mosel in 2007. Take a walk near along the Mosel River and look up at some of the steepest vineyards in the world such as Bernkasteler Doctor and Wehlener-Sonnenuhr. Beneath you will be a greyish slate, which imparts the mineral, flinty flavours found in the Rieslings made from these steep vineyards that face south and southwest to receive maximum exposure to the sun. The wines are unique – the crystalline, lacy flavours of Riesling that are always free of oak influence. The purity of these wines, their transparency and their delicacy have always made them highly sought-after in the past by the European royalty. There was a period during the 20th century when these sweet and off dry styles of Germany were no longer in vogue, but modern consumers are discovering them anew. Much has been written over the past decade about the ‘Riesling Renaissance’ with consumers appreciating the quality and longevity of Rieslings, particularly from the Mosel. Producer worth visiting in the region include: Egon Muller who makes fabulous long-lived Rieslings that are always in high demand and JJ Prum, another legendary producer from this region. Others worth visiting or at least trying their wines include: Selbach-Oster, St Urbans-Hof, Dr Loosen, Max Ferd Richter, Fritz Haag and Heymann-Lowenstein. This is one of the most dynamic and exciting wine regions in the world with less than 30 years of history in wine growing. The weather is so cool that the area has always been better known as a posh ski resort than a wine and food destination. Much has changed from the mid 1990s when there were less than a dozen wineries to the current number, which is over 70. Central Otago is the most southerly wine region in the world where grapes struggle to ripen. This makes it the perfect place for Pinot Noir. Currently, about 80% of the region is planted to this challenging variety – both hard to grow and difficult to make. As the largest town in the region, Queenstown is the place that most people fly into for their holidays. The beauty and charm of Queenstown is such a strong draw that it will be an effort to venture outside of the town to the wine regions which lie about one hour’s driver outside. There are breathtakingly beautiful mountains that surround the town and many lakes in the region with the most notable one being Lake Wakatipu. For outdoor sports lovers, the region is a paradise – hiking, camping, fishing, bungy jumping whitewater rafting, sky diving, water skiing in the summer or skiing in the winter. There are some 75 wineries to visit and many are equipped to entertain visitors with friendly staff and a range of wines on offer at the cellar door. Key wine regions in Central Otago are Bendigo, Bannockburn, Gibbston and the Cromwell basin. Each region is geographically different which accounts for the very diverse style of Pinot Noir produced here – from serious, tannic full bodied reds with black fruits to delicate, ethereal beauties that have lacy flavours, lean body and crisp acidity. Must visit wineries include: Felton Road one of the top producers of Pinot Noir from biodynamic vineyards (try their Block 3 and Block 5 Pinots); Quartz Reef, making serious, age-worthy Pinot Noirs; Rippon, where they produce elegant reds; Mount Difficulty, a wine that offers value from its basic range to its single vineyards; and Two Paddocks, owned by the actor Sam Neil from the movie Jurassic Park. Although grape growing and winemaking may be attributed to regions in Europe, wine marketing and oenotourism has its roots in Napa Valley. The concept of marketing wines by grape variety rather than by the confusing European place names originated from California and the concept of an industry dedicated to wine tourism also originated here. Visit any Napa Valley winery with a cellar door and you are greeted by friendly staff with big smiles who are there to demystify wine. They offer personal guided tastings, arming you with the right words and vocabulary to describe why you like the wine that you do. There is really no other wine region in the world as friendly, warm, inviting and helpful. There are a wealth of great restaurants in Napa, namely the towns of St Helena and Yountville with the latter attracting top 3 Michelin star chef Thomas Keller who upped the culinary ante by establishing the fine dining restaurant, French Laundry, in Napa. The region continues to expand its culinary repertoire and good Japanese restaurants can be found including the brilliant Terra restaurant by chef Hiro Sone. Other great restaurants include Bistro Jeanty, Redd, Auberge du Soleil, The Restaurant at Meadowood and Bistro Sabor. Napa Valley is a very diverse region with wine styles that vary widely so exploring the key regions are the best ways to discover the difference between a Howell Mountain Cabernet and one from Rutherford bench for example. Besides the two regions already mentioned, it is worthwhile visiting and trying the wines from Mount Veeder, Oakville, Stag’s Leap and Oak Knoll. Most of the wineries in Napa have spacious, comfortable cellar door operations with friendly, knowledgeable staff. There is normally a charge for wine tastings but the range of wines one can try makes it useful. Wineries to visit include: Opus One, for its unique winery and cellar; Robert Mondavi and Inglenook (also known as Niebaum-Coppola) – both for their historical significance and their beautiful, iconic, visiting centres. Others include: Chateau Montelena, Heitz, Stag’s Leap Wine Cellars, Schafer, Beaulieau Vineyard, Diamond Creek, Caymus, Joseph Phelps, and sparkling wine producers Schramsberg and Domaine Chandon. It is true that the beautiful castles or chateaux in the Medoc, in the left bank of Bordeaux, are unoccupied and only seem to exist as show pieces. The wealthy owners of these historical properties are large conglomerates, insurance companies or millionaires who made their fortune elsewhere and have houses around the world. While there is a sense of being in a museum when you visit chateaux like Margaux, Haut-Brion, Lafite or Mouton, it is very different on the other side of the Gironde River where properties are much smaller and the variety that is favoured over Cabernet Sauvignon is Merlot. Of course visiting the grand chateaux on the left bank are compulsory, but to stay for an entire week and get a feel of the local lifestyle and atmosphere, head over to the right bank straight to the town of St-Emilion. This is by far the most charming and prettiest town in Bordeaux with its limestone caves, cobble stone streets, numerous restaurants and quaint shops. There are architectural relics from the Middle Ages throughout the town and one needs at least a full day to explore the architectural highlights of this beautiful town. There are vineyards surrounding the town and within 15 minutes drive, one can explore at least a few dozen wineries. Here, the winemakers live on premise, farming their land as it was done for centuries on small plots that are a fraction of the size of the Medoc chateaux. There are hardly any empty, majestic castles and the wine producers seem more like farmers compared to the suit-clad businessmen managing the properties on the left bank. Take time to visit St-Emilion’s greatest producers, which include Ausone and Cheval Blanc, two of the most expensive, highly sought-after wines from this region. Others that are less pricey and making fantastic wine include: Beau-Sejour Becot, Figeac, Troplong Mondot, Canon la Gaffeliere, Clos Fortet and Pavie. The biggest drawback of Maipo is how far away it is from Asia – to get there, it requires two different planes and about 30 hours in the air. But once you arrive, you realize why the journey was worth it. Maipo is the wine region surrounding the capital city of Chile, Santiago. It is the headquarters to the wine industry with most of the important wine companies situated in the city or in its vicinity. The city itself is only about 500 years old and one is never very far from either the Pacific Ocean or the Andes mountains. This narrow strip of land that belongs to Chile is only 430 kilometres at the widest point and 4,600 kilometres long. Some have called Chile a viticulturists’ paradise since disease pressure is low and very few viticultural challenges found in other regions exist here. With low rainfall, irrigation is necessary using the water from the Andes mountains. The main variety in Maipo is Cabernet Sauvignon although Carmenere and Merlot are quite significant too. Wine is part of the culture, starting from the Spanish and other European immigrants who settled in Santiago over the past few hundred years. However, it is only over the past 25 years that Chile has become a major wine exporter, creating an industry that is reliant on export markets. Chile’s wineries are much more casual and homey than the sleek operations of California. Many offer cellar door tastings and an increasing number of visitors and locals make an effort to visit and taste from the cellar. Among the largest producers, it is worthwhile to visit Concha Y Toro and Santa Rita. To visit smaller wineries producing the best wines of Chile, make appointments at: Almaviva, Don Melchor, Sena and Vinedo Chadwick.